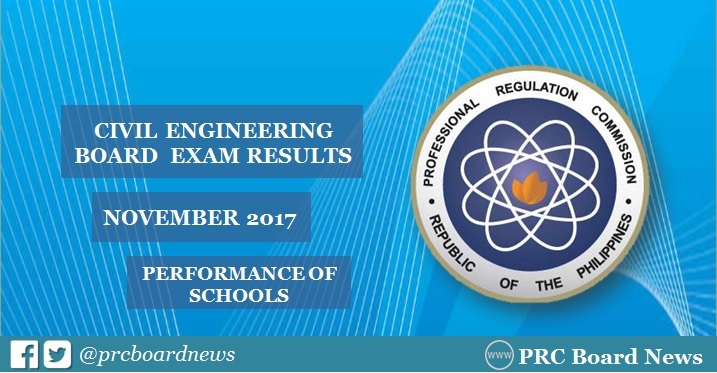 MANILA, Philippines - The Professional Regulation Commission (PRC) recognizes the top performing schools in the November 2017 Civil Engineer (CE) board exam. The result was released on Tuesday, November 21, 2017 or in four (4) working days after the last day of examinations. University of the Philippines (UP) - Diliman led the schools with 97.41% passing rate or 113 out of 116 passed the exams. UP-Los Banos placed second with 96.55%, 56 out of 58 successfully hurdled the exams. Bohol Island State University (BISU) - Tagbilaran ranked third with 87.04% or 47 out of 54 examinees passed. PRC administered the Civil Engineer licensure exam in the cities of Manila, Baguio, Cagayan de Oro, Cebu, Davao, Iloilo, Legaspi, Lucena, Tacloban, Tuguegarao and Zamboanga on November 11 and 12, 2017. In the November 2016 Civil Engineer board exam, University of the Philippines (UP) - Diliman led the schools with 96.08% or 98 out of 102 passed the tests. It was followed by UP-Los Baños (UPLB) with 95.16% or 59 out of 62 passed. In the November 2015 exams, UPLB dominated the schools with 96.61% or 57 out of 59 successfully hurdled the tests. UPD ranked second with 89.89% or 80 out of 89 passed. Super tagal ng CE results. Great post, Generally the rustic zone contains the certifiable space of the nation, so there is a need to http://www.summarizetool.com/our-text-summarizer-services/discover-the-benefits-of-our-paraphrase-tool/ site to that area with the assistance of gave educators, redesigned educational informative undertakings for a transcendent conceivable predetermination of the nation. Great site, Nowadays progressively the instructive capacity and learning we have the better we are. You can browse this site to manage your any kind of writing work. The present world is flooding with sharp and insightful individuals. Along these lines and get new thoughts.